Treyarch has confirmed that weapon camouflage is coming to Call of Duty: Black Ops 4’s battle royale mode Blackout and announced upcoming changes to the Blackout map. So if you’ve been asking for either of those you can rest easy for now – they’re coming. It’s was Treyarch’s studio design director, David Vonderhaar, who replied to Blackout players on Twitter confirming both the incoming camos and map updates. Concerning the camos, Vonderhaar explained the studio is currently working on getting them in the battle royale mode but did not give further details or release dates. 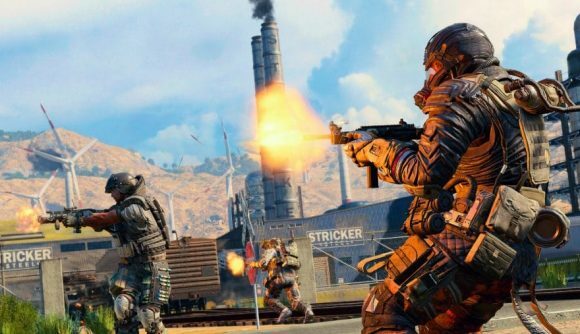 It’s also unclear at this point whether or not weapon camos unlocked in the other Black Ops 4 game modes will transfer over to Blackout once they become available. We’ll have to wait until the camos are added to find that out. Another Twitter user asked Vonderharr about a change in Blackout’s map to which Vonderhaar confirmed this was also currently in development. Once again, Vonderhaar did not give any information about a release date but did confirm there will be an update to the map and that he has played it himself. Vonderharr also added that Treyarch is “on record as saying that we are more intrested in adding/subtracing and morphing this map then making new maps.” The Blackout map has only had a small change since its release in beta back in September. Weekly updates change the placement of zombie spawns but there has yet to be a big change to the layout. These confirmations come less than a week after Treyarch announced its new Safeguard mode. The new mode has players working actively together to secure a win instead of killing everything and anyone in sight. Expect plenty more changes to coming to the hugely popular Blackout mode soon.